After this weekend’s review of Spicy Temptations, I had another experience of the diversity of Chinese cuisine last night with a little tasting event at Karamay on Leicester’s London Road. I reviewed this venue’s spicy Uighur cuisine from the far-West of China in late 2105 and am pleased to see it’s still doing well. Last night’s event was pitched at expanding the horizons of a few food enthusiasts and was built around a demonstration of hand-pulled noodles, one of the distinctive elements of Western Chinese food. Chef Yili Year showed fantastic skill, dramatically pulling out long strands from a flattened dough ball and then forming a sort of cat’s cradle to further stretch them. It was a real pleasure to see this difficult task done with consummate ease – I was glad we weren’t encouraged to have a go, could have got embarrassing. We would later enjoy the super-fresh, almost udon-style noodles with spicy beef sauce and a few other dishes such as the familiar beef in black bean sauce and fearsomely-spiced crispy chicken, spicy prawns, chicken pastries and rice that was more a middle Eastern pilaf than, say, yeung chow style fried rice. Karamay has a big open kitchen behind a window and the cheerful chef team seem more then happy for you to have a look-see. Food adventurers should definitely give this place a try. I’ve been meaning to get round to reviewing Spicy Temptations ever since it was recommended to me as a good venue for authentic, fiery Szechuan food. I wasn’t disappointed. As you’ll pick up from this review which appeared in the Leicester Mercury at the weekend, it’s pretty basic, but there was some great food there. Cost: Lunchtime snacks around £6 a head, plenty for dinner around £15 a head. One of the joys of this job is that I’m incentivised to check out places that I may not otherwise have visited. Sometimes the result is to prove my scepticism correct. Sometimes, however, you come away totally won over and eager to tell other people to give this place try. Spicy Temptations falls very much into the second category. This is one of those simple, basic Chinese cafes that has sprung up to serve the booming numbers of Chinese students seeking a taste of home. Its location is ideal – just outside the Highcross restaurant quarter and its high rents, but surrounded by big players such as Cosy Club and lively independents such as Lilu, Maiyango, Meatcure and, from next month, the revived Richard III pub. It’s easy to miss and doesn’t exactly look inviting. You look through the window into what appears to be a pokey, rather bleak living room. Enter though, and out the back you’ll find a rather more welcoming space with a little bar and a TV showing Chinese pop music. It’s still very humble and no frills, the handwritten note at each table with the wi-fi password perhaps furthering the sense that the core clientele are young students far from home. The very extensive menu is available in English, even if some of the young, helpful staff are not all that fluent. And that menu is a real treasure trove of authentic Chinese, and in the main Szechuan, cuisine. The Chinese, famously, seem up for eating anything that moves, and pretty much every part of it too. This is the first restaurant that I’ve been in that has a whole section of duck tongue dishes, along with the likes of spicy Szechuan frog and fried pork intestine with pig blood. On an initial lunchtime scoping visit we tried a few of charcoal barbecue skewer dishes – big, plump, shell-on prawns were marvellous, grilled with a pungent house rub of chilli, cumin and more. Chicken gizzards though were a disappointment. The gizzard is a hard-working muscle in a bird’s stomach and I’ve thoroughly enjoyed them lightly cooked in a salad Perigourdine in France where they called gesiers. These though were dried out and rubbery. Lamb skewers were better, a little crunchy on the outside, still moist and flavoursome within and perked up by more of that spicy rub. We also shared a terrific appetiser dish of shredded pigs tripe, thinly sliced with a green vegetable – it could have been cucumber. Served cold as is tradition, this was very tasty – the tripe itself is not strongly flavoured but with brightly-spiced soy dressing and hits from chilli and peanuts it was a great dish. I’d seen enough to know I wanted to come back for more. On a Saturday nigh we got stuck into some of the more substantial dishes. Twice-cooked pork is another Szechuan classic and this was a fine version. Pork belly had been boiled, finely sliced and then stirfried with green and red peppers and onions, with a spice mix including chilli, ginger, doubanjiang (broad-bean paste) and some pungent, salty black beans. Refined it was not, and all the better for it, and along with some tender bite-size pieces there were delicious little crispy bits of pork scattered throughout the dish invitingly. Chicken in XO sauce was probably a more conventional dish to western palates, with tender pieces of chicken stir-fried with celery and carrots. Nice but maybe lacking the fire power of our other dishes. Noodles with braised brisket were fabulous – cooked in fiery, bright red chilli broth the noodles had taken on plenty of the flavour, while chunks of tender brisket with that slightly gelatinous feel from long slow cooking lurked within. Star dish of the night though, and early contender for dish of the year, was the spicy aubergine with sweet and spicy garlic sauce. Beautifully prepared and cooked, the aubergine was perfect – soft but retaining texture, glazed with a sweet sauce that included finely minced pork and which had the tastebuds tingling. One thing that stood out here and indeed all the dishes was careful prepping of ingredients – there are some serious knife skills being used in that kitchen. If you’ve ever felt there must be life beyond the takeaway or you just want to recapture the authentic tastes of China – then Spicy Temptations should be on your list to visit. It may look unprepossessing but go in the spirit of adventure and you should find the food uncompromising, punchy and very enjoyable. I enjoyed a recent to the Peking on Charles Street in Leicester. Chinese restaurants today can sometimes seem a little intimidating to those who grew up on simplified Cantonese food introduced by the Hong Kong diaspora, but the Peking is a friendly place with menus that can keep everyone happy. The Peking has been in Charles Street for as long as I can remember. 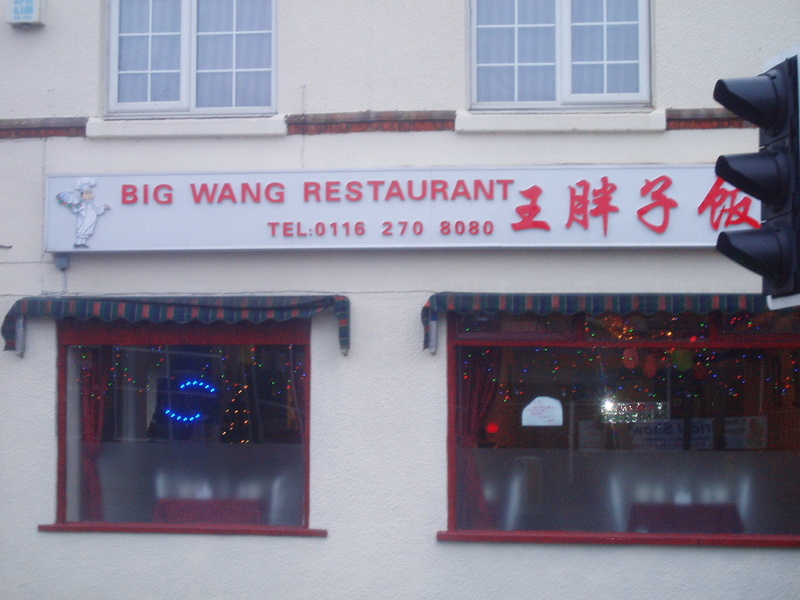 One of those big Chinese restaurants that evolved to serve a mainly English clientele who had only the vaguest notion of what Chinese food was about, but knew they liked the novel flavours. It was ruled over by a matriarchal figure known to all as Maureen, a big character who ran a lively restaurant that was often full of big boisterous groups. Times change, and the presence of a significant Chinese student community has changed the scene significantly, but the Peking carries on. Last year Maureen retired and the place was bought by an old friend of the restaurant Adi. Wisely, while there’s been refurbishment, not much has changed and the experienced chefs and other key personnel remain. When we rocked up as two middle-aged white men, we were given the main à la carte menu which is still familiar to those who’ve eaten there over the last thirty years or so. We realised later there was a more challenging menu with duck’s tongues and deep fried pig’s intestines. We weren’t too bothered – there’s no shortage of places to try the wilder shores of this cuisine and anyway we were keen to see whether Peking retained its old school appeal. First off there was a very warm welcome, from Adi himself and his staff team, including a marvellous old gent with a winning smile who I can only assume loves the work so much he can’t bear to retire. He greeted everyone in the restaurant like a long lost friend and looked after us splendidly. We were seated next to a huge fish tank – we could probably have had a swim in it ourselves – as we checked out the main menu. There’s a small dim sum selection on there as appetisers and we picked pork and prawn dumplings and Peking spare ribs. Both were marvellous. The ribs were meaty, soft and moist, crucially having good degree of fat left on them. I’d had some pretty dreary, dry old ribs a week back in a Highcross chain (oh all right it was Wagamama), but these had me licking my lips and wiping up the sweet and spicy sauce. The dumplings too were well-made, well-balanced, well-spiced. Main courses followed including pork with XO sauce and sizzling Mongolian lamb. Both dishes were also winners in our book. The pork again was tender, the saucing restrained but tasty, the chilli definitely there but not overwhelming and the vegetables – onions, celery, mangetout – were crunchy and fresh. The Mongolian nature of the lamb is really about the barbecue-style cooking. Coming on a hot platter there’s a nice bit theatre of table as the sauce is poured on for a big sizzle, shortly followed by a splash of wine. There’s gratifying steam and sound as the cooking and caramelisation process finishes and it really works. The lamb pieces were tinged with black and the crunchy, sticky bits down at the bottom of the platter were, as often is the case, completely delicious. The spicing and saucing is actually more South-East Asian, with lemongrass, coconut and Malayasian curry spices – great flavours all. The yeung chow fried rice – another familiar dish with prawns, char sui pork and spring onions – and some simple fried noodles completed things well. I’m sure there are people who think some of these kind of dishes somehow inauthentic, but that would miss the point. This was food cooked with care and precision and the flavours were great. Why should we care if it’s not the same as remembered by someone who once had chicken feet on a business trip to Guandong? It was quite a nostalgic experience but you can’t help but think that there will continue to be a place for the Peking when it produces food like this. All part of a healthy food scene. I can’t pretend I know anything about Chnese food. Sure I’ve read stuff but you don’t learn that way do you? You learn by trying the good and trying the bad – and I’ve just not eaten enough of the former. You’ve got to respect the efforts of the Hong Kong immigrants who’ve put Chinese food in every town in the nation, but we all know they presented a simplified version of a complex cuisine in order to attract the timid locals. But our relationship to China is very different now. Earlier this year I patched up two separate friends who both happened to be on business in Shanghai at the same time – inconceivable a few years ago. And of course it works both ways – friends who teach in higher education say their classes are packed with Chinese students. All of which means we’re leaving behind the chow mein years. Chinese restaurants are catering for Chinese clientele who expect what they enjoy back home. Thus it was that four of us paid a visit at the weekend to Han Dynasty on Abbey St, near St Margaret’s bus station in Leicester. From the moment we entered it was clear it was going to be fun but also that we were well out of our comfort zone. 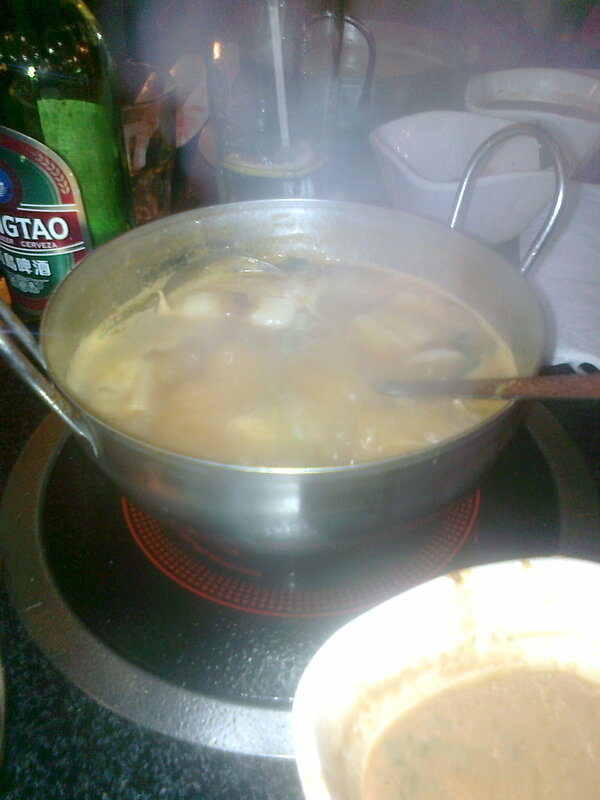 The joint was jumping, packed full of young Chinese, with large pots bubbling away on their tables. Once seated we were asked if we wanted a la carte or “hotpot” – we jumped in and said hotpot, which resulted in big approval from the staff. Our waitress, who had the biggest smile I’ve ever seen on a human being, promised to explain what to do. 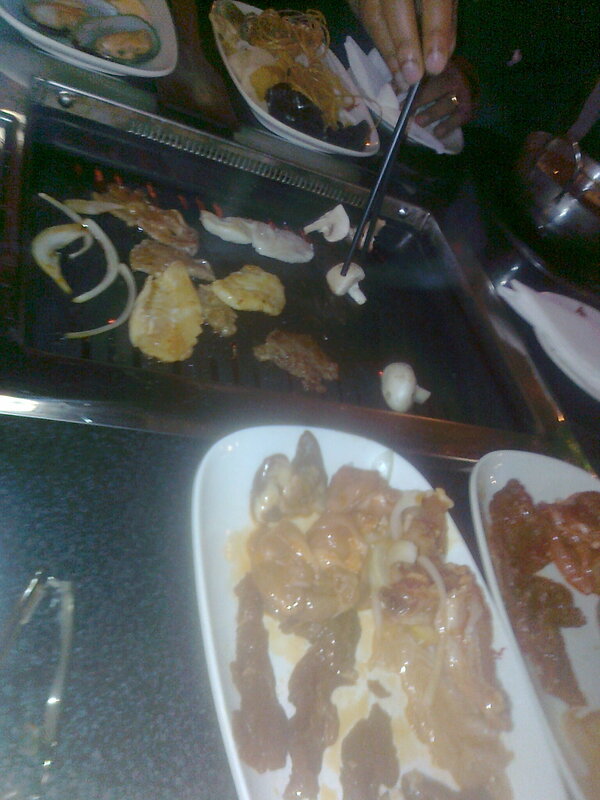 Each table has an induction hob at each setting and and barbecue grill in the centre. You choose a soup flavour, which becomes your cooking broth steaming away on your hob. Then a visit to the buffet bar to create your dipping sauce from a wide range of ingredients, most of which we were in the dark about. Then it’s collect a variety of marinated meats and fish and a selection of raw veg, varieties of tofu, dumplings, salads and other stuff. Back to your table to grill what needed grilling, poach what needed poaching and dip what needed …well you get the picture. It took us a while to get up to speed, somewhat nervously looking around to see how were others doing it. Once we realised we were along the the right lines we started to relax – the Tsingtao helped – and realised some of this was really nice food. Can’t tell you much about precise ingredients but certainly the prawns and squid were great, the meat was tasty and there were many hits and as well as a few misses among the unfamilar stuff. Best of all we felt was the concept – good fun, very communal, flexible and interactive. We were having a really good time, and this seemed preferable to loading up with fried food and sticky sauces keeping warm under lights. A few things confused me – once we’d loaded up the soup with noodles and veg, it started to reduce down into a really tasty mixture. Then before you could stop them, someone filled it up with some watery stock. Maybe I’m missing the point. So apologies to all you sophisticates for this naive newbie account, but we all start somewhere. Han Dynasty has branches in Birmingham, Nottingham and Plymouth – if you’ve been to any of these or indeed to similar places in downtown Beijing, and have tips on the best ways to enjoy, please do share. An interesting take on gaining notoriety from this new restaurant on Welford Road, Leicester. So a happy new year to all readers, thanks for checking in over the past year and I wish you all many memorable meals in 2011. I have to say I’m not very knowledgeable, or especially enthusiastic, about the subject of Chinese food. Of course I’ve mainly encountered only the fairly grim version doled from takeaways to those with a beer-prompted hunger and no desire to cook. On the few occasions I’ve ventured into Chinatown to look for something more authentic and of better quality I’ve ended up with gruel and a sneer from shouty waiters. The likes of Hakkasan weren’t around when I lived in London. In Leicester I do patronise the Marchee Wok, an upmarket takeaway in upmarket Stoneygate, where the food is of fair quality, but even then my usual approach is simply to get a huge tray of their capital spare ribs to gnaw on as comfort food after the latest dispiriting home defeat for City. Anyhow there is a bevy of Chinese restaurants now on High Street in the city centre and I can feel myself tempted to give one a try out. Real China in Highcross looks like standard issue anglo-chinese buffet, while Shanghai Moon looks seems to cater for a predominantly Chinese clientele and has extensive dim sum menu. It’s somehow slightly intimidating. And this week come a newcomer, Taste of China. I’ve only been in to pick up a menu but it looks intriguing. The decor and atmosphere is of a fast food cafe, but the menu has several of the distinguishing characteristics of “interesting” Chinese restuarants – a refusal to explain unfamiliar items for the benefit of insular Brits, imaginative translation and a number of dishes to make you scratch your head. Among the items on offer here are “Beef Internal Delicacies” “Beef tendon lo main”, “preserved egg and salted egg congee” “luncheon meat and two eggs noodles in soup” and “coffee and tea mixed”. They also serve Borscht. I hope there’s not too much of a whiff of “oh those funny orientals” about this. As I said, the ignorance is all mine and I’d like to know more about the food and what I might like. So has anyone out there got any recommendations either in terms of restaurants or dishes that they’d like to recommend?